Men’s varsity basketball began the week defeating Foothill 95-90 at home on Tuesday, Jan. 15. 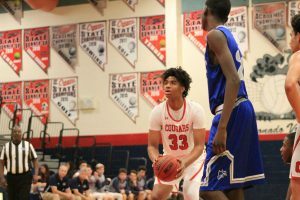 The Cougs’ defense held the Falcons from gaining a lead while sophomore Jaden Hardy (#1) scored 34 points and junior Max Howard (#21) shot 16 points for the Cougs. The Cougars squashed Basic 94-63 at home on Thursday, Jan. 17. In the first half, the Cougs took the lead 61-31. Though the Wolves scored more in the third quarter, they failed to comeback and win. Junior Jhaylon Martinez (#33) scored 24 points along with freshman Richard Isaacs (#2) scoring 14 points. Men’s varsity basketball stands 4-0 in league and plays again at home against Tech on Wednesday, Jan. 23 at 6:30 p.m. 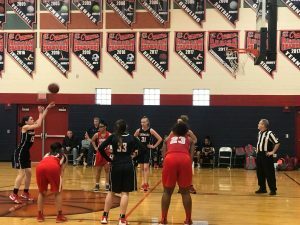 The women’s varsity basketball team clutched a 53-52 win over the Foothill Falcons on Tuesday, Jan. 15 at home. Senior Tia Thornton (#11) led the Cougs with 15 points while junior Gabbie Etopio (#15) contributed 12 points. The winning streak continued as varsity crushed the Basic Wolves 66-34 on Thursday, Jan. 17 for another home game. The Cougar’s superior offense kept them ahead the whole game. Juniors Giuliana Caringella (#25) and Sade Williams (#23) scored 12 and 13 points respectively. Women’s varsity basketball has a 2-2 league record and a 10-7 overall record. The Cougs return on Wednesday, Jan. 23 at 6:30 p.m. at Tech High School. Preparing to catch the ball, senior Reagan Raimer catches the ball and scores a touchdown. 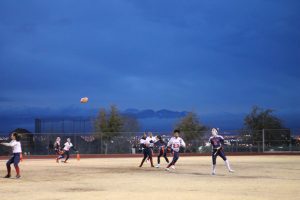 Varsity flag football won 20-6 on Wednesday, Jan. 16 in a home game versus Liberty and lost 0-6 at Tech on Friday, Jan. 18. In the home match against Liberty, senior Jaelyn Eisenhart rushed for 97 yards, averaging 9 yards per carry. Sophomore Kaylin Hall, quarterback led the team to victory with 157 passing yards and three touchdowns. The Cougars ended the week losing a tough 0-6 battle against Tech. Both teams’ solid defense kept the game scoreless until Tech made a strong play and scored in the fourth quarter. Flag football will face off against the Foothill Falcons today at home at 4:30 p.m. The varsity wrestling team crushed the Basic Wolves 57-24 on Wednesday, Jan. 16 for the second league match of the season. Freshman Spencer Brock, sophomore Dominic Batara and junior David Darlington all won by fall in less than a minute. 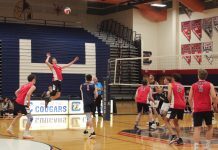 Seniors Andrew Olson and Kevin Burdalski also contributed to the Cougar victory with wins by fallout. 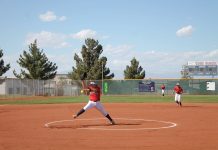 Varsity currently sits with a 1-1 league record and 3-5 overall record. Wrestling’s next match is against the Foothill Falcons on Wednesday, Jan. 23 at 6:00 p.m.